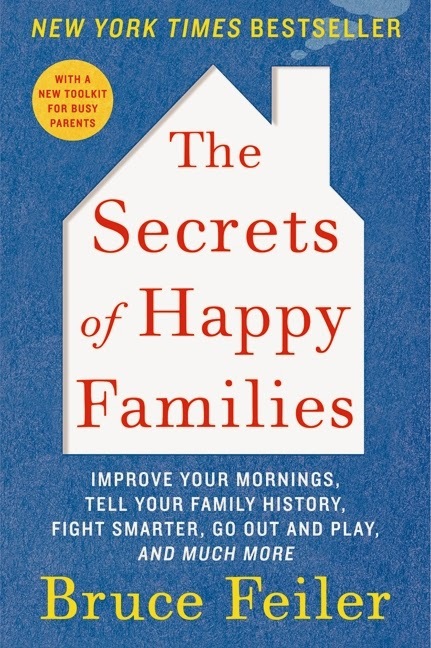 Today I get to talk to you about a book I've been reading, The Secrets of Happy Families by Bruce Feiler. Before I even try to tell you about it, I have to say that I was skeptical about this. So many self-help parenting types of books out there just aren't worth the time it takes to read them, much less the time involved in reading and reviewing. My thoughts: I am really enjoying this. Feiler keeps the tone light and fun, and the amusing and oh-so-very-real stories keep me turning the pages. I can tell you straight away that I won't be implementing all of the ideas given in the book, but almost all of them at least make me think about how we are doing things and why. Feiler talked to experts in all sorts of areas where group dynamics are important, but avoided all the traditional "family experts" in his research. He then adapted what he was finding, and tried things with his family. This means that you are not going to read the 'same old, same old' advice, but you will hear fresh and unique ideas. One idea/chapter that I love talks about not worrying about "family dinner" at all. The ideas in that chapter are fabulous. How about a family breakfast? Or family dessert? Or a huge Sunday afternoon meal? Fresh, funny, and actually filled with ideas that seem worth trying out. Exactly what I want in a "family advice" book.